Delaware consumers who used Western Union from 2004 to 2017 to send money to scammers and lost their money are reminded they have a month to file a claim to get their money back under a legal settlement. Under a settlement between Western Union and state attorneys general, including Delaware, anyone who was tricked by scammers into sending money by Western Union between January 1, 2004 and January 19, 2017 can go to www.ftc.gov/WU before February 12, 2018. Some people who have already reported their losses to Western Union, the Federal Trade Commission, or another government agency will receive a form in the mail from the claims administrator, Gilardi & Co. 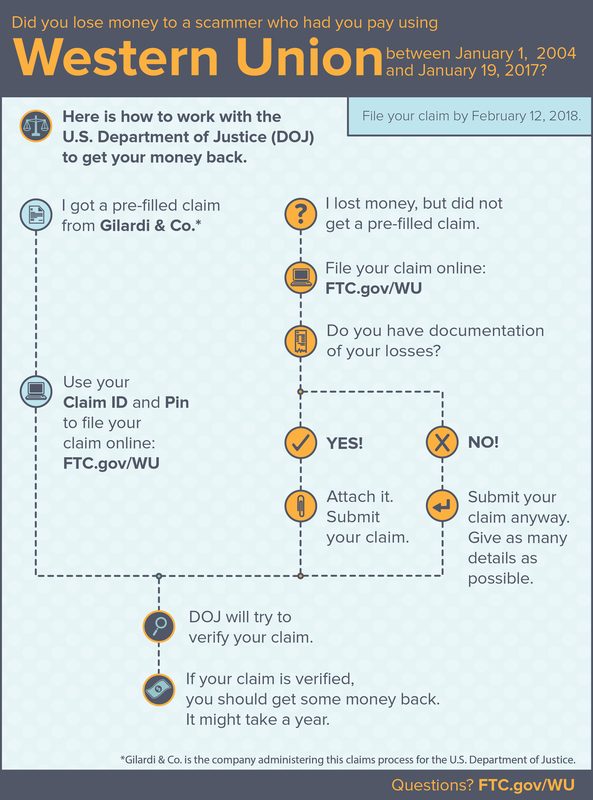 The form will have a Claim ID and a PIN number to use when filing a claim online via FTC.gov/WU. Gilardi was hired by Justice Department, which is responsible for returning victims’ money as part of its settlement with Western Union. Filing a claim is free, so consumers should not pay anyone to file a claim on their behalf. No one associated with the claims process will ever call to ask for consumers’ bank account or credit card number. If you lost or did not receive a claim form, there is also a link on www.ftc.gov/WU which will enable you to file. The attached graphic from the FTC is a simple explanation of the claims process. The settlement with Western Union came after state and federal consumer protection agencies alleged that fraudsters were able to use Western Union’s money transfer system to get payments from their victims, even though the company was aware of the problem and received hundreds of thousands of complaints about fraud-induced money transfers made for fraudulent lottery and prizes, family emergencies, advance-fee loans, online dating and other scams. The settlement announced in January 2017 required $586 million from Western Union to repay consumers, and required Western Union to develop and put into action a comprehensive anti-fraud program designed to help detect and prevent incidents where consumers wire money to scam artists. Previous Announcements from the Delaware Department of Justice regarding the settlement and claims process can be found at https://news.delaware.gov/2017/01/31/wu/ and https://news.delaware.gov/2017/11/13/wus/. Attorney General Matt Denn and the Department of Justice Consumer Protection Unit warn Delawareans about scam calls regarding jury duty being made to residents. DOJ and other agencies have alerted the public to these scams previously, but have received continued reports of them occurring, including recently in Sussex County. In the scam, the consumer is told over the phone that they failed to report to jury duty and that a sheriff will arrest them or that a capias will be issued for the consumer. The consumer is then told they can pay a fine and that the caller will not send the sheriff to apprehend them. There are some clear indicators that these calls are a scam. Delawareans eligible for jury duty are always notified about their obligation to serve jury duty by mail; never by telephone, and the sheriffs in Delaware do not have arrest powers. Hanging up on aggressive callers, particularly those who threaten you with arrest. The Attorney General encourages consumers who believe they may have been scammed to call the toll-free Consumer Hotline at 1-800-220-5424 or email the Attorney General’s Consumer Protection Unit at consumer.protection@delaware.gov. If you receive a call but have not paid any money to the scammers, you can report the phone number to the National Do Not Call Registry and file a complaint, www.donotcall.gov. If you are an adult Delaware resident, a registered voter, possess a Delaware driver’s license or state ID card, and are a U.S. citizen, you may be called for jury duty in Delaware. Consumers should always be diligent about their duty to serve as a juror, and, when summoned, appear as required. Consumers who are unsure whether they have missed a summons to jury duty, can and should contact Jury Services at the Superior Court in their county using the numbers above. The Consumer Protection Unit of the Delaware Department of Justice warns Delawareans during this peak vacation season to be careful when they are looking for a vacation rental. The scammers operating rental scam schemes find legitimate rental postings and capture the information and photos of the property, and then list it on Craigslist or other online advertising platforms. Unsuspecting consumers looking for a good deal on a vacation rental find the bogus posting, send a deposit, and receive confirmation of their rental only to arrive and find other people in the home, are unable to gain access, or are otherwise turned away from the property they believed they had rented. Rental home scams are also occurring with regard to longer term residential rentals. Again ads are placed on sites like Craigslist and marketed at very low monthly rental rates. The scammers steal information from legitimate for-rent postings, and troll neighborhoods for vacant, abandoned and foreclosed homes. Prospective tenants in these scenarios may be shown the property before moving in as the scammers have changed the locks to unlawfully gain access. The scammers will collect a security deposit and first month’s rent, and may even provide keys and allow the consumer to move into the property. Typically, only when the true owner or a neighbor notices, will the tenant be aware they have been conned. The scammers in these scenarios typically require that monthly rent be paid in cash and will often appear in-person at the residence to collect the rent. Research who the true owner of the property is by doing a parcel search online: In Delaware, one can search New Castle County properties at http://www3.nccde.org/parcel/search/; Kent County properties at http://kent400.co.kent.de.us/PropInfo/PIName.HTM, and Sussex County properties at, https://sussexcountyde.gov/zoning-and-sales-information. If you meet the person claiming to be the landlord, request to see their credentials, such as a business card or realtor’s license, and identification; you should also make note of the make and model of their car and the license plate number. Consumers who believe they may have been scammed should contact their local police department and file a report. They can also call the Attorney General’s toll-free Consumer Hotline at 1-800-220-5424 or email the Consumer Protection Unit of DOJ at consumer.protection@delaware.gov. If the listing was posted on an online platform, such as Craigslist, the consumer should also file complaints with the online platform and with federal law enforcement at www.ic3.gov. The Attorney General’s Consumer Protection Unit announced that a New Castle County-based contractor faces criminal charges for defrauding multiple Delaware homeowners. Mario Mareno, 49, doing business as Tradesmen Services, was arrested on Friday, May 13 by the First State Fugitive Task Force on four outstanding warrants for Home Improvement Fraud from the Delaware State Police, the New Castle County Police, and the Middletown Police Department. The Consumer Protection Unit is aware of other homeowners who have contacted authorities regarding Mareno and believes that there are more victims who have not yet come forward. Law enforcement believes Mareno typically solicits and corresponds with victims via Facebook, text messaging, or email, and gets the victims to make large up-front payments, allegedly to obtain required permits and purchase materials, and then never substantially completes the work. In some cases, victims say they have discovered that Mareno did not obtain permits or purchase materials as represented. Mareno allegedly gives victims excuses for why the work is not done, and repeatedly promises to refund up-front payments but never actually does so. Additional alleged victims have been identified by the Consumer Protection Unit, and the office urges other consumers, who believe they may have been victimized by Mareno or Tradesmen Services, or have information to share with authorities, to contact Consumer Protection Unit Special Investigators Jose Ortiz (302-577-8421) or Alan Rachko (302-577-8309). If consumers suspect they are a victim of home improvement fraud, they should contact the Attorney General’s Consumer Fraud Hotline at 1-800-220-5424. WILMINGTON, DE – The Consumer Protection Unit of the Delaware Department of Justice is warning Delawareans of a number of scams involving wire transfers and prepaid debit cards. Stop. Don’t act immediately no matter what the crisis may be and no matter that the scammer appears to know information about your family that no one else could know. Check with the person who seems to be in trouble at a trusted phone number or email address. If the caller says not to tell anyone or that if you delay then the loved one will suffer some consequence those are signs of a scam. Don’t send money. If the caller wants money to be wired or a prepaid debt card, you know it’s a scam. Do not wire cash or provide the caller with a prepaid debit card. Scammers can spoof a telephone number on caller ID so that it looks like the call is coming from a legitimate source such as a courthouse or a sheriff’s office – but it’s not. Law enforcement or court personnel never make a call like that. Stay calm. Don’t let the caller scare you. Note as many details about the call as you can, such as the phone number the caller appears to be calling from and who they claim to be, and end the call. Call the Consumer Protection hotline at 1-800-220-5424 to report it. Do not send money or give the caller any personal or financial information. The IRS would contact you by mail, not phone. Stay calm. Although the caller ID may indicate that the call is coming from the “IRS”, that number is being spoofed. Write down as many details about the call as you can, such as the caller ID number and who they claim to be. Contact the IRS directly if you are worried that the call is real at 800-829-1040 or go to irs.gov. • The Treasury Inspector General for Tax Administration (TIGTA) at tigta.gov or 800-366-4484.